When we arrived on the bank this morning on our 10am whale watch, the patchy fog made it a bit difficult to find whales. 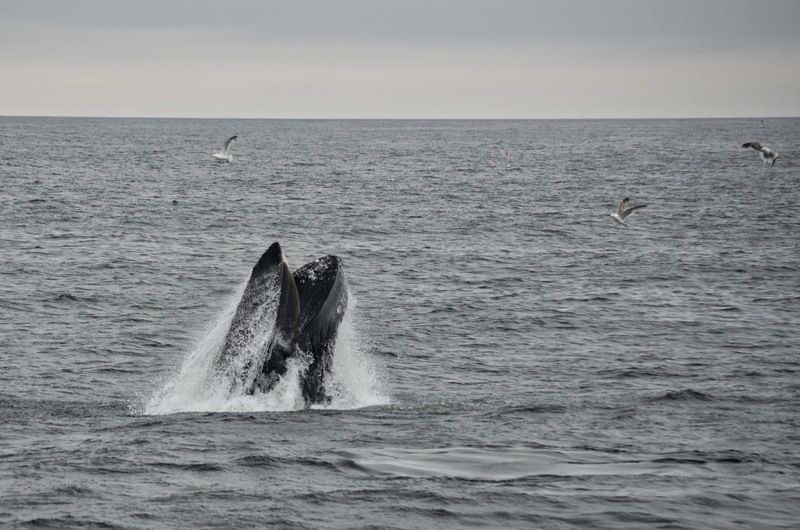 With a little luck and some help from neighboring vessels, we first came across two large fin whales traveling north. Swimming very quickly, this duo vanished through the thick fog as quickly as they appeared. 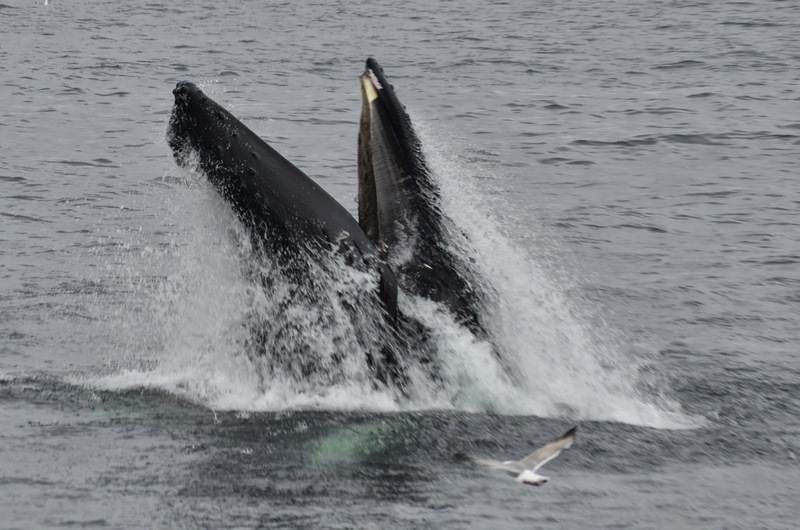 Further ahead of us, the one and only humpback whale named Osprey was open mouth feeding. I’ve said it before, this whale gets around! I can probably count on one hand how many whale watches I’ve been on this season where I have NOT seen Osprey. Osprey wasn’t the only humpback in the area. As the fog thinned, we spotted Measles in the distance who was putting on a spectacular display of power lunge feeding! 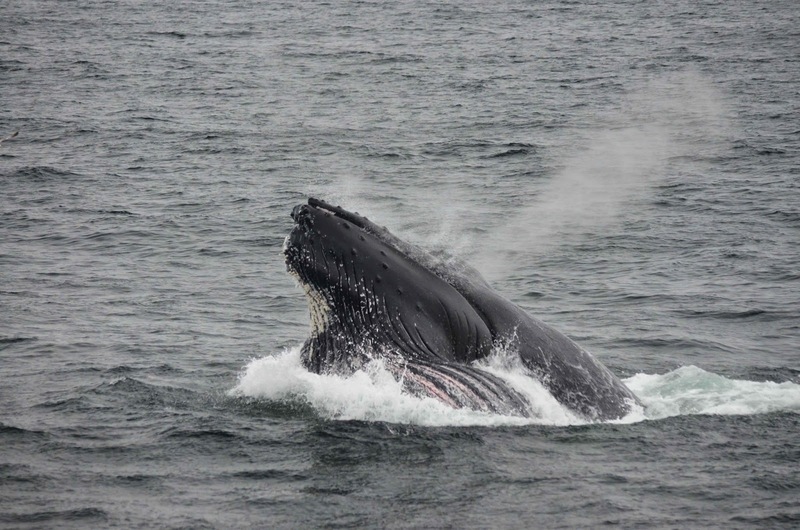 The fog had dissipated by the time we made it out on our 1:30pm whale watch and Measles was at it again! First seen in 2002, Measles is at least 12 years old and by the looks of it a very strong whale! The lunges Measles was making while feeding made it look more like a breeching frenzy then a feeding frenzy. With every open mouth lunge, Measles pushed half its body out of the water along with hundreds of gallons of sea water and a whole lot of sand lance! With each breeching lunge Measles landed with a huge splash as its ventral pleats flattened against the surface of the water! This went on for the entire whale watch! It was clear Measles was working the fish into dense bait balls below the boat, sometimes using bubbles and sometimes using just its body to manipulate the fish and force them to the surface. All we had to do to know where Measles would surface was to look and listen for the bate on the surface of the water and there he/she was lunging high up out of the ocean! 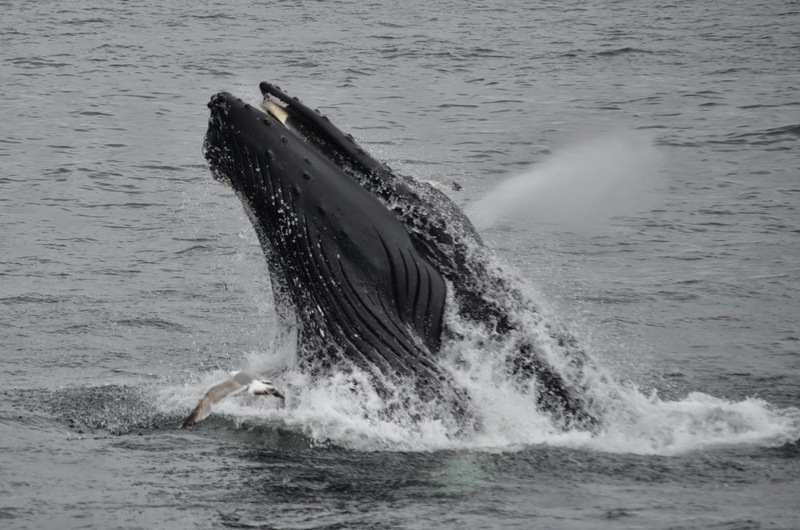 I have never seen a lunge feeding whale exhibit such immense power with each mouthful! It was truly incredible to witness! There was tons of bait in the water and a number of other animals in the area were enjoying their fair share. On our way out, we saw a fin whale (possibly one of those we saw earlier) swimming very quickly in our same direction. A small gray seal was sighted a number of times throughout the trip and was possibly one of the unseen forces moving the bait around the surface of the water as the fish were pursued from beneath. 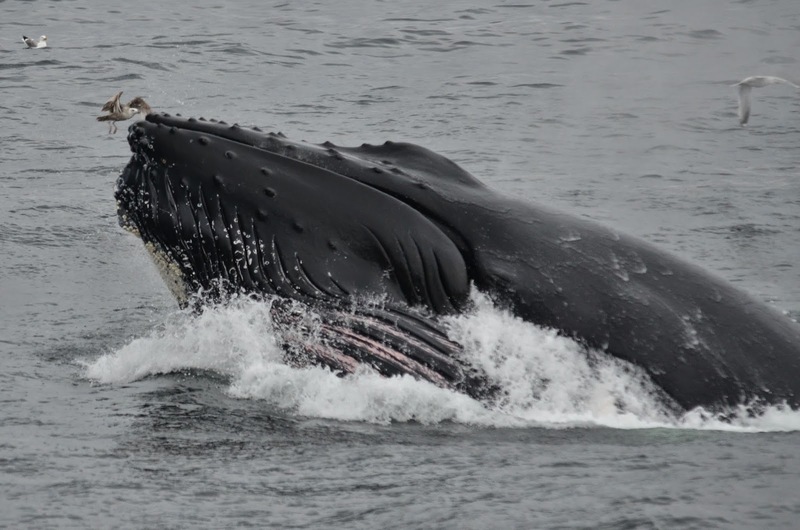 As we cruised away from the feeding scene, Measles, joined by an unknown humpback, continued to feast! We and the whales had another spectacular day on Stellagen Bank!